Munich Airport has a lot going for it, amenities-wise. There’s the brewery/beer garden, the play areas for kids, the sleeping cabins, the observation deck, and the MAC Forum that’s used to host everything from summer surfing to a full=blown Christmas Market. 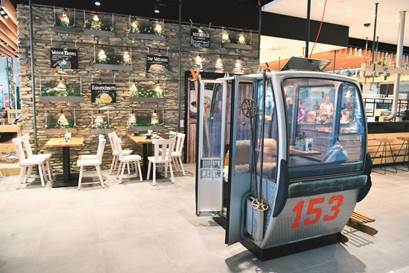 Now there’s one more fun way to spend time at Munich Airport: eating in a gondola taken from a real ski lift. The airport has a new restaurant – Sportalm – in Terminal 2, that serves Alpine specialties in a mountain-decor, a gondola, a sports bar and, opening next month, an upper level sun terrace with love seats and lounge chairs. To set the scene of a traditional Upper Bavarian farmhouse, the decor includes tree trunks, knickknacks, an old barn door and a stone trough – all things that give the restaurant “authentic snugness and originality,” according to the airport. (At least) two airports will have free skating rinks on site this holiday season so travelers can take a spin on the ice while waiting for their flights. Denver International Airport’s rink opens on Friday, in the outdoor plaza between the main terminal and the Westin Denver International Airport. The rink, complete with carolers and seasonal music, will be there through January 1, from 9 in the morning till 9 at night. Time on the ice is free and complimentary skates are available. 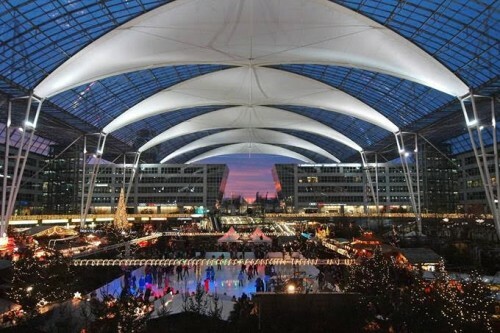 There’s also a free ice-skating rink at Munich Airport – with a space set aside for curling – as part of the airport’s Christmas Market. In addition to free skating (there is a small fee for renting skates), Munich Airport’s Christmas Market has food booths, entertainment, craft workshops and, of course, a visit from St. Nick.